Cricut December will be out in stores soon! Journaling says: Eric and Tanya were sealed for time and all eternity in the Seattle temple on Wednesday July 27th, 2011. Their ring ceremony afterwards was beautiful. I'm so excited to have a new sister!!! How to: Cut as many hearts as desired from patterned fabric paper. Spray a teal cardstock background with white mist, adhere two photos at the bottom using foam squares, tuck a brown felt scalloped border under the left and right sides of the photo block, and tie aqua baker’s twine around the bottom with a bow in the center. Tuck a chipboard key under the baker’s twine bow then frame the photos with two large chipboard brackets. 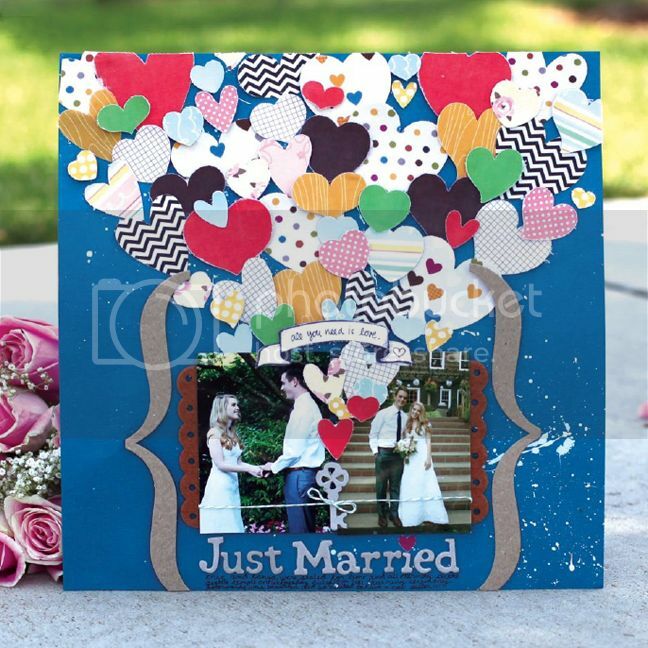 Place a chipboard title under the photos, dot the “i” with a mini red fabric paper heart, and write journaling with a black pen below the title. Adhere the cuts starting at the top of the photos and working up to the top edge of the layout; use a variety of depth of foam dots to create multiple levels of dimension then trim any excess. Add a fabric sentiment above the photos. Note: I was totally inspired by Stephanie Howell for this layout :) (You can see her layout on THIS POST). Journaling says: I'll always remember Christmas 2009. It was the first Christmas we were all together under one roof - a very special roof - the cabin at Lake Wenatchee. The snow, the twinkle lights, the smell of pine trees... it all made for "perfection"! 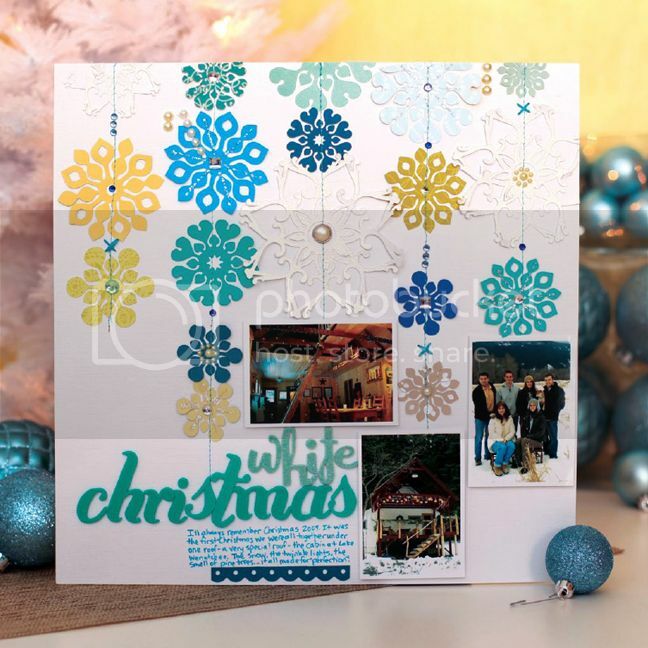 How to: Cut as many snowflakes as desired from cardstock and/or patterned paper. Adhere the cuts in straight lines down from the top edge of a white cardstock layout background then sew straight lines down each row using aqua thread. Embellish the cuts with jewels, pearls, and iridescent glitter glue as shown. Adhere a small photo at the bottom of three of the rows of cuts using pop dots. Make a title using letter stickers and write journaling with a blue pen below. Punch a scalloped border from blue cardstock, adhere it under the title, then stitch three “x”s using aqua floss across the stitched lines. Journaling says: I'm so glad that my mom took the time to dress me up every once in a while as a baby and get my picture taken so I could see what I looked like growing up. It's fun to comare baby photos of me and Chris to baby Fox to see who he look more like. Maybe one day he'll do the same thing with his kids' photos. So anyways, this is me as a newborn, a few months old, and a couple years old. How to: Cut as many flowers as desired from cardstock and/or patterned paper. Spray a zigzag cream patterned paper background with aqua mist, sew a border around the edges using aqua thread, then journal around the edges using a black pen. Adhere a grid of small photos to the center of the layout using pop dots. Tuck the cuts under the top left and bottom right corners of the photos, add a couple more to the top right corner, then embellish the centers with pearls and jewels. Create a title across the middle of the photos, use a typewriter to make the rest of the title, and adhere it on the right side. Embellish the layout with pearl flourishes, a flower fabric brad, and two decorative stickpins as shown. 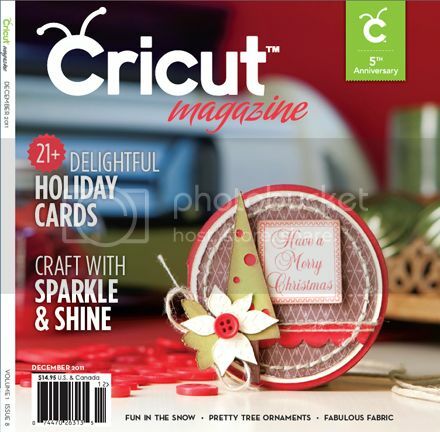 Make sure to pick up a copy of the new Cricut Magazine for 132 pages of goodness! I sooooooooooo want your job!! Great layouts as usual!! you are the most inspiring lady I know. LOVE these, Paige! I love all these pages, especially the White Christmas one! So pretty and soft. Gorgeous layouts!! Love the inspiring pages! I love these layouts, Paige! *SIGH* beautiful work Paige! Very inspiring!! Wow, these are awesome layouts..!!! Great ones.. Thanks Paige for visiting my blog with inspired comments.. Your blog really enjoying to watch.. I am always happy with your visits..!! Cheers! Great layouts! Love them all! I am itching to get a cricut. Hopefully soon I will have one!!! Love the layouts (as always! )they are all beautiful, especially White Christmas...amazing!